Married Name Her married name was Mikkelsen. Marie Hansen married Anders Mikkelsen. Marie Hansen was born at Denmark. Name Variation Johanne Catarine Larsdatter was also known as Bogild. Johanne Catarine Larsdatter was born on 26 April 1789 at Ikast, Hammerum, Ringkobing, Denmark. Married Name before 1921 As of before 1921,her married name was Bendigsen. Thora Petersen was born circa 1899 at Denmark. She married Johannes Kristian Tøger Bendigsen, son of Anton Emil Bendixen and Anne Dorthe Mikkelsen, before 1921. Anton Emil Bendixen was born on 18 January 1921 at Herning, Hammerum, Ringkøbing, Denmark. He was the son of Johannes Kristian Tøger Bendigsen and Thora Petersen. Name Variation Jacob Meissel was also known as Misel. Name Variation Jacob Meissel was also known as Mizel. Name Variation Jacob Meissel was also known as Misal. Jacob Meissel was born circa 1807 at Strasburg, Bas-Rhine, Alsace, France, also reported as Germany. He married Christiane Breitenbucher, daughter of Johann Martin Breitenbucher and Eve Weimer, before 1836. Jacob Meissel married Mary (?) in 1860. Jacob Meissel died on 18 June 1885 at Orangeville, Wyoming, New York. Ship Name: Sir Robert Peel. 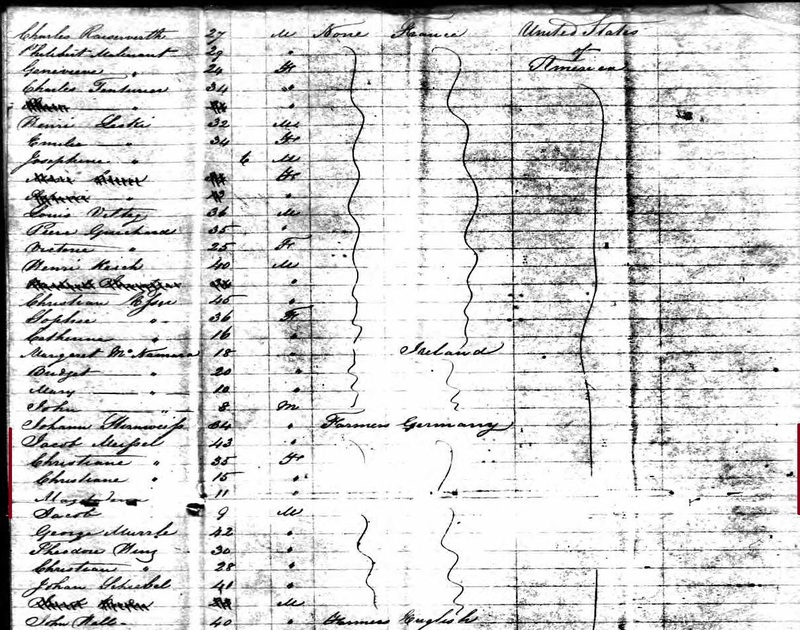 [S248] U.S. Federal Census 1860 U.S. Federal Census, by Ancestry.com, Page 31. Dwelling 238. 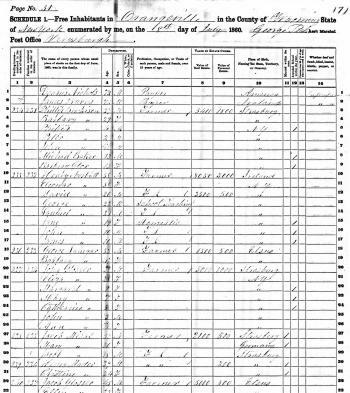 [S247] U.S. Federal Census 1870 U.S. Federal Census, by Ancestry.com, Year: 1870; Census Place: Orangeville, Wyoming, New York; Roll: M593_1119; Page: 239B; Image: 56568; Family History Library Film: 552618. Name Variation Jacob Meissel was also known as Missel. Name Variation Jacob Meissel was also known as Meisel. Jacob Meissel was born in 1842 at Bas-Rhin, Alsace, France, also reported as Nov 1839. He was the son of Jacob Meissel and Christiane Breitenbucher. Jacob Meissel married Mary Ann Zubler before 1867. Jacob Meissel was born circa 1867 at New York. He died on 13 January 1904 at Attica Center, Wyoming, New York. He was buried after 13 January 1904 at Union Park Cemetery, Wethersfield Springs, Wyoming, New York. 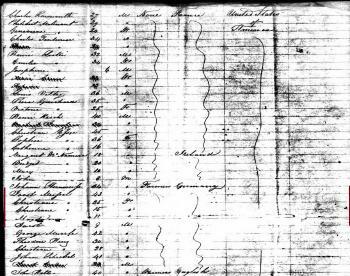 1 June 1875 Allen, Allegany, New York Jacob Meissel appeared on the census of 1 June 1875 at Allen, Allegany, New York. [S246] U.S. Federal Census 1880 U.S. Federal Census, by Ancestry.com, Year: 1880; Census Place: Orangeville, Wyoming, New York; Roll: 948; Page: 210C; Enumeration District: 207. Name Variation Katherine Misel was also known as Catherine. Name Variation Katherine Misel was also known as Meisel. Married Name before 1883 As of before 1883,her married name was Lang. Katherine Misel died at USA. She was born in May 1848 at Germany. She married (?) Lang before 1883. Katherine Misel died after 1910. Katherine Misel immigrated in 1865. She had 2 with 2 living in 1900 children. [S245] U.S. Federal Census 1900 U.S. Federal Census, by Ancestry.com, Year: 1900; Census Place: Baltimore Ward 10, Baltimore City (Independent City), Maryland; Roll: 612; Page: 9B; Enumeration District: 0130; FHL microfilm: 1240612. [S244] U.S. Federal Census 1910 U.S. Federal Census, by Ancestry.com, Year: 1910; Census Place: Baltimore Ward 10, Baltimore (Independent City), Maryland; Roll: T624_556; Page: 11A; Enumeration District: 0148; FHL microfilm: 1374569. (?) Lang was born at Germany. He married Katherine Misel before 1883. (?) Lang died before 1900. John J. Lang was born in June 1883 at Maryland. He was the son of (?) Lang and Katherine Misel. Name Variation Mary Ann Zubler was also known as Nora. Married Name before 1867 As of before 1867,her married name was Meissel. Married Name before 1867 As of before 1867,her married name was Misel. Mary Ann Zubler was born on 8 October 1850 at Switzerland. She married Jacob Meissel, son of Jacob Meissel and Christiane Breitenbucher, before 1867. Mary Ann Zubler died on 30 December 1922 at Warsaw, Wyoming, New York, at age 72. 1 June 1875 Allen, Allegany, New York Mary Ann Zubler appeared on the census of 1 June 1875 in the household of Jacob Meissel at Allen, Allegany, New York. Hanne Wilhelmine Albertine Frohreich was born on 12 May 1859 at Dorphagen, Pomerania, Germany. 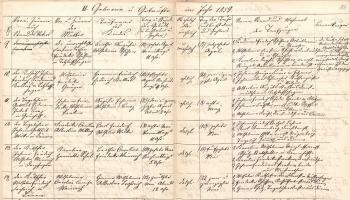 Hanne Wilhelmine Albertine Frohreich was baptized on 22 May 1859 at Dorphagen, Pomerania, Germany. Stillborn son Frohreich died on 13 January 1866 at Dorphagen, Pomerania, Germany. He was born on 13 January 1866 at Dorphagen, Pomerania, Germany. Wilhelm Weinreich was born at Germany. Married Name Her married name was VanNatta. Lillian B. Schindler married Harold John VanNatta, son of Reuben Melvin VanNatta and Clara Mae Schuster. Lillian B. Schindler was born on 19 June 1900. She died on 11 May 1969 at age 68. Wilma May Bateman married William Melvin VanNatta, son of Reuben Melvin VanNatta and Clara Mae Schuster. Wilma May Bateman was born on 13 June 1911 at Iowa. She died on 1 February 1998 at Iowa at age 86. Name Variation Robert E. Beyer was also known as Bob. Robert E. Beyer was born on 23 June 1920. He married Helen Lucille VanNatta, daughter of Reuben Melvin VanNatta and Clara Mae Schuster, on 14 August 1940 at Dubuque, Iowa. Robert E. Beyer died on 4 September 2010 at age 90 Robert Bob E. Beyer, age 90, of Platteville died Saturday, September 4, 2010 at his daughters home. He was born on June 23, 1920 in rural Platteville, the son of George and Rose (Dean) Beyer. Bob was united in marriage to Helen Lucille VanNatta on August 14, 1940 in Dubuque , Iowa . She preceded him in death on July 8, 1996. Bob married Della Martens on September 27, 1997 in Platteville. She preceded him in death on May 5, 2009. Bob farmed in rural Platteville for 20 plus years. He also owned and operated Bobs Mobile Home and Refrigeration for many years. In later years, Bob worked at B & B Gas Station for 17 years, retiring in 2007. He loved horses, enjoyed woodworking and making clocks. Bob also liked to restore old cars, including building a replica 1901 Oldsmobile. Bob is survived by four daughters: Betty (Jerry) Waydick, Arkdale, WI, Nancy (Paul) Bendorf, Platteville, Shirley Smith (special friend, Royce Rogers), Oregon, WI and Sherry (Tom) Paulus, Platteville; 11 grandchildren; 28 great-grandchildren; 7 great-great-grandchildren; two sisters: Isabelle (Jacob) Kurth, Sheridan, WY and Leta Buss, Rocky Mount, VA; a half-sister, Betty Lou Woodcock, MO; two half-brothers, Frank (Cathy) Beyer, Platteville and Clarence (Donna) Beyer, Lancaster; a sister-in-law, Marian Beyer, Madison; nieces, nephews, other relatives and friends. He was preceded in death by his parents; his wives, Helen and Della; two sisters, Helen Kurth and Frances Goke and his brother, Herman. Funeral services were held at 11:00 a.m. on Friday, September 10, 2010 at the Free Methodist Church in Platteville with Pastor Jeff Suits officiating. Burial was held in Hillside Cemetery , Platteville. Family and friends were welcome from 4:00 until 8:00 p.m. on Thursday, September 9 at the Martin Schwartz Funeral Home in Platteville and from 10:00 a.m. until time of service Friday at the church. (?) Haas married Genevieve Pearl VanNatta, daughter of Reuben Melvin VanNatta and Clara Mae Schuster. Geraldine (?) married Arnold VanNatta, son of Reuben Melvin VanNatta and Clara Mae Schuster. Geraldine (?) was born in 1923. She died on 20 June 2008 at Iowa. Myrl Buckingham married Maybelle Schmidt. Maybelle Schmidt married Myrl Buckingham. Selma Amalia Gustafsson was born on 21 April 1882 at Skaraborg (Västra Götaland), Sweden, also reported as 21 Jul 1882. She was the daughter of Lars Johan Gustafsson and Gustava Charlotta Svensdotter. Married Name Her married name was Pettersson. Anna Teresia Gustafsson married (?) Pettersson. Anna Teresia Gustafsson was born on 20 April 1884 at Mariestad, Skaraborg (Västra Götaland), Sweden. Anna Teresia Gustafsson died on 27 March 1969 at age 84. Alfrida Eleonora Gustafsson was born on 20 June 1886 at Mariestad, Skaraborg (Västra Götaland), Sweden, also reported as 30 Jun 1886. Alfrida Eleonora Gustafsson died on 30 January 1967 at Mariestad, Sweden, at age 80. Johan Oskar Gustafsson was born on 18 October 1888 at Mariestad, Skaraborg (Västra Götaland), Sweden. He was the son of Lars Johan Gustafsson and Gustava Charlotta Svensdotter. Gustaf Adolf Gustafsson was born on 16 June 1893 at Mariestad, Skaraborg (Västra Götaland), Sweden. Gustaf Adolf Gustafsson died on 13 February 1947 at age 53. Karl Arvid Gustafsson was born on 20 April 1895 at Mariestad, Skaraborg (Västra Götaland), Sweden. Karl Arvid Gustafsson died on 22 June 1942 at Mariestad, Sweden, at age 47. (?) Pettersson married Anna Teresia Gustafsson, daughter of Lars Johan Gustafsson and Gustava Charlotta Svensdotter. Married Name 24 June 1907 As of 24 June 1907,her married name was Gustafson. Emma M. Johnson was born circa 1881. She married Carl Gustav Gustafson, son of Frans Oskar Gustafsson and Charlotte Peterson, on 24 June 1907 at Woodbury, Iowa. [S250] U.S. Federal Census 1930 U.S. Federal Census, by Ancestry.com, Year: 1930; Census Place: Concord, Clackamas, Oregon; Roll: 1940; Page: 1B; Enumeration District: 0025; Image: 235.0; FHL microfilm: 2341674. Paul F. Gustafson was born circa 1908 at Iowa. He was the son of Carl Gustav Gustafson and Emma M. Johnson. Myrtle C. Gustafson was born circa 1910 at Iowa. She was the daughter of Carl Gustav Gustafson and Emma M. Johnson.